In this Blog-Post I’d like to cover the topic of “Seamless transition of HANA-models from virtual to persistent data access by leveraging HANA Synonyms”. SAP HANA provides the capability to access and integrate local and remote data into HANA Models, which provides a great flexibility and agility for instant remote data access without having the need to ELT the data first to a local table. This functionality is frequently requested by the Business-Analysts community to integrate additional remote data-sets into a given set of HANA-Models. Additional aspects like Data Management, Performance and Application Lifecycle Management will arise, once the remote data quality gets mature, the access frequency and number of users leveraging the enhanced HANA models accelerates. IT will be in-charge to integrate the remote data-set into the common HANA system environment without impacting the already enhanced HANA models, as there should be no impact to the Business-Analysts way of working. It’s a straight forward process to align the Business-Analysts and IT way-of-working by following below steps. Define a User-Provided Service (CUPS) to connect to the remote system and table(s) within the SAP HANA Cockpit. Configure a HANA Smart Data Access (SDA) virtual table definition to connect to the remote table [.hdbvirtualtable + .hbdvirtualtableconfig] within the SAP WebIDE project. 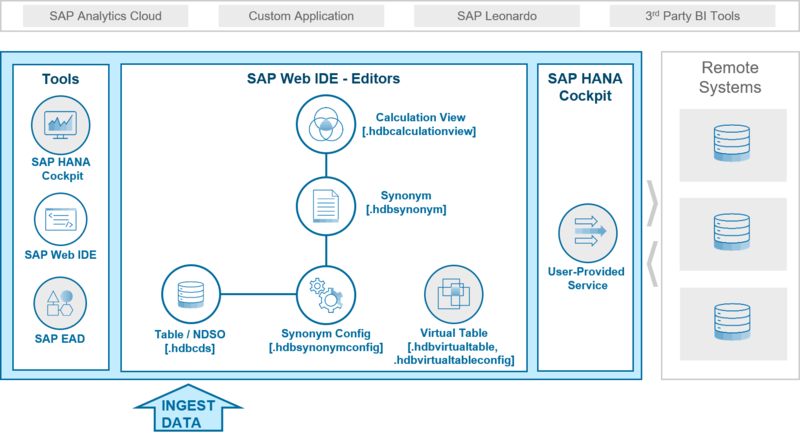 Define a Synonym as an Abstraction layer of the HANA model [.hbdsynonym] to connect to, instead of connecting straight to the persistent object within the SAP WebIDE project. Define the Synonym-Connection to configure and connect the Synonym to the remote (Virtual Table) object [.hbdsynonymconfig] by leveraging the SAP WebIDE graphical Synonym-Editor. Query the HANA model to access the data available in the Remote System table. Adjust the Synonym configuration to switch the Synonym connection to a local persistent object (Table, NDSO) [.hbdsynonymconfig] by leveraging the SAP Full-stack WebIDE for SAP HANA graphical Synonym-Editor. Query the HANA model to access the data available in the local persistent object (Table, NDSO). The HANA Model configuration stays unchanged without any impact to the consumer. Pls find attached a Recording of the “Seamless transition of HANA-models from virtual to persistent data access by leveraging HANA Synonyms” scenario.